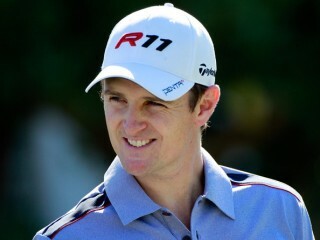 Justin Peter Rose, born in Johannesburg, is a South African-born English professional golfer who plays most of his golf on the PGA Tour while keeping his membership on the European Tour. He won the 2007 Order of Merit on the European Tour and has previously been ranked inside the top ten in the Official World Golf Ranking, with his best ranking being number six. Justin Rose burst to prominence at The Open Championship in 1998 when he finished fourth as a seventeen year old amateur. He turned professional the following week, but initially struggled badly, missing the cut in most of the events he played in the following twelve months. Justin Rose's career soon began to take off however, and he became established on the European Tour. He won his first professional event, the Dunhill Championship in South Africa, in 2002, and followed this up with three further victories in that year. In 2003, he reached number 33 in the Official World Golf Rankings. In 2004, he played mainly in America on the PGA Tour, while also maintaining his membership of the European Tour. He did not have a good year, and slipped out of the top 50 in the world rankings. His ranking continued to fall in early 2005, and in March he announced that he was quitting the European Tour and concentrating on playing in the U.S. This had no apparent effect on his poor form, and by the middle of the year he had fallen out of the World Top 100. In August of that year he made an about face by announcing his intention to return to the European Tour. Ironically later the same week he had his best result of the year, leading the Buick Championship after three rounds before slipping to a third place finish. One or two further good results followed late in the 2005 season, and in 2006 he remains on the PGA Tour after all. In March 2011, Rose had a chance to add to his two PGA Tour titles won in 2010, when he entered the final round at the Transitions Championship with a one stroke lead. However he shot a three-over-par 74, which included four consecutive bogeys in the middle of the round, to finish five shots behind the champion Gary Woodland. In September 2011, Rose won the BMW Championship, the third of the four FedEx Cup playoff events at Cog Hill Golf & Country Club. This was his first title of the year and third career PGA Tour win. Rose entered the week on the playoff bubble at 34th in the standings, knowing that he needed a good finish to make the final event at East Lake Golf Club. The win elevated him to 3rd in the standings and the position of knowing that if he won the Tour Championship he would be the FedEx champion. A flawless round of 63 on the opening day helped Rose to build a four stroke advantage going into the final round, and even though there was a late wobble with a bogey at the par five 15th, Rose recovered and won by two strokes from John Senden. Rose did not enjoy the same success at the Tour Championship though, when a second round 75 ended his chances of winning. He finished the tournament in a tie for 20th place and 5th on the overall FedEx Cup Standings. On March 11th, 2012 Rose claimed a fourth USPGA Tour win at the WGC-Cadillac Championship at Doral, in Florida. A final round two-under 70 was enough to win by a shot from Watson, who missed a 10-foot birdie putt at 18. View the full website biography of Justin Rose.